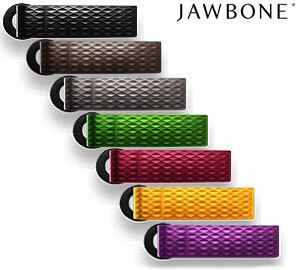 For years now I've been a big fan of the Aliph 'Jawbone' series Bluetooth headset. Not only for its stunning design, but for the quality product and sound clarity. Naturally, when Kevin asked me if I would like to do a review of the brand-new Jawbone PRIME, I was all over it like nobody's business. In my review I'll step you through the product and provide you with a few good pictures of the new device... and by the end you may even be convinced to pick one up (you won't regret it - this is my favorite headset to date). Side note: I'm not going to bore you with all of the initial setup instructions, how to pair the device with your BlackBerry etc... Lets face it, we all know how to do that, and if you don't, I'm happy to report that both headsets here come with very clear instructions on how to do so. Let's get down to it! ...And what a box it is! The packaging of the PRIME is very nicely done, as is to be expected. All of the accessories, power supplies, earloops, etc. are packaged in an exposed and front-facing manner. As soon as you crack the package you're displayed with most options right in front of your eyes! Everything you need to go wireless is packaged perfectly into the box. Two big thumbs up for packaging and presentation of the device. Definitely first-class. Before I go any further I thought it would be appropriate to touch just a bit on the extraordinary technology built-in to the PRIME. Jawbone PRIME has even better background noise elimination than the previous generations. NoiseAssasin™ 2.0 delivers an order of magnitude improvement in the noisiest environments (6 to 9dB) extracting even more noise while keeping the user's voice natural. It's important to note that both headsets come with an 'Acoustic Voice Activity Detector'. This detection device provides a 'fail-safe' of sorts... When the detector isn't in contact with your cheek/face, the Jawbone will perform as good if not better than most headsets available on the market. But when the detector is in contact with your face (as it should be!) it's like getting a turbo-boost in performance. A turbo-boost in performance indeed. I decided to test the PRIME's voice detection and background noise elimination by performing the 'head out of the car window' test. While it looks absolutely foolish, I have tested all of my Bluetooth headsets by driving around with my head out the window while on a call. It looks absolutely foolish and is a tad dangerous, but for my purposes I had to do it. Suffice it to say, the PRIME outperformed every other headset I've tested. Background noise was nil, and the recipient of the call on the other end could hear me loud and clear. 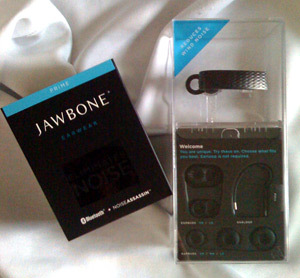 Bottom line is the Jawbone PRIME packs some great technology into a great package. The device is light (feels slightly lighter than the Jawbone 2 to me...), background noise is all but completely eliminated when in use, and the acoustic voice activity detector works brilliantly in delivering clear and crisp audio to the device on the other end. 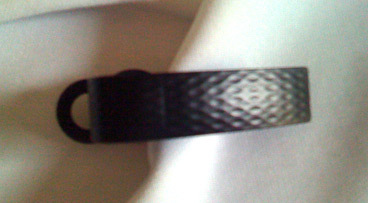 I'm pleased to report here that the Jawbone PRIME is the best-fitting Jawbone yet. This, primarily due to the new earbuds that come packaged with the device. Note the new style earbud. I like. The new earbuds packaged with the PRIME have an extra circle of soft rubber sticking out of them... Looks a little odd for sure, but once you try them, I think you'll agree they are a great improvement. The key is however how you insert the earpiece into your ear. With the new style of earbud on the device, point the Jawbone DOWN, insert into your ear, and then turn the device UP until the voice activity sensor (VAS) is touching your cheek/face. That's it... The headset should now be very snug within your ear WITHOUT an earloop! Perfect! I can't tell you how pleased I am to be running around town with no earloop on my Bluetooth headset. The temperatures are warming up here, and it was/is always tricky to get comfortable with a headset AND sunglasses/glassed on. The arm of the sunglasses and the earloop of the headset would always battle each other on the side of my noggin'... Not a comfortable deal at all. If you've ever experienced this problem you'll know exactly what I'm talking about. Thankfully, with the PRIME you can say goodbye to that problem for good. No earloop necessary. It's awesome. 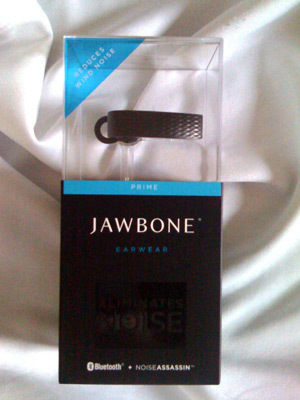 Two thumbs up to the Jawbone PRIME for delivering and unparalleled fit. 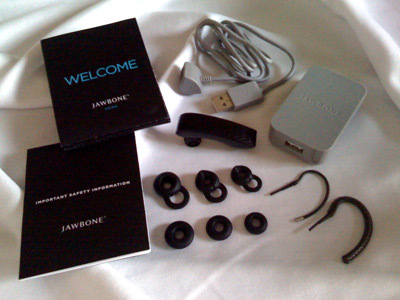 The Jawbone PRIME: One Solid Device! I have to admit, I'm no 'aficionado' of Bluetooth headsets, but I've seen and used my fair share. 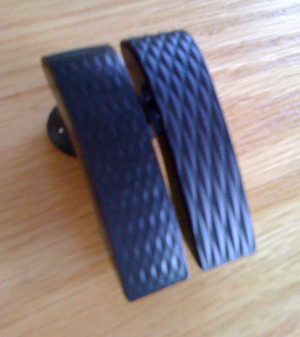 And, to this day, I've never put hands on a device as well put together as the Jawbone PRIME. For that matter, both the Jawbone PRIME and its predecessor the Jawbone 2 are put together to form a solid and well-built product. While I'm at it, I seem to recall the original Jawbone was up to this standard as well. The Jawbone's are certainly on the high-end of the Bluetooth headset spectrum... And if there's one thing I've learned over the past few years when it comes to Bluetooth headsets... you get what you pay for! Once you have one you will probably never want to give it up! So it looks good... But is it easy to use? Using the Jawbone PRIME is dead easy. As I mentioned at the beginning of the review I'm not going to get into the initial setup and pairing of the device, but handy step-by-step instructions are included should you need them. Answering calls is as easy as a tap on the 'talk' button, which is the main button on the outside of the device itself. Pressing the talk button will also answer an incoming call while you're on an existing call. 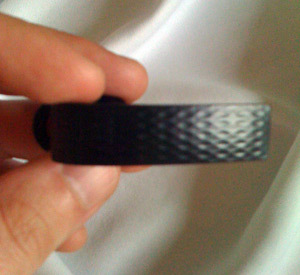 To reject a call simply hit the noise assassin button near the back of the device. The call will be immediately rejected. Finally, to toggle Noise Assassin on and off simply press the Noise Assassin button and hold for 2 seconds. Noise Assassin is always on by default. The important thing here is to play/fool around with the device to get used to it. Because the buttons are 'hidden' on the device, the more you use it, the more familiar you'll get with it... and before you know it using the Jawbone PRIME will be second nature to you. Important side note: Before you start using your Jawbone, be sure to charge it up for around 50 minutes with the included USB cable or wall charger. The indicator light will change from red to white when the device is charged and ready to go. Suggested Retail Price is $129.95. Available for less at ShopCrackBerry.